Winning the first race of the day was Joel Ronning of Minneapolis on Catapult. 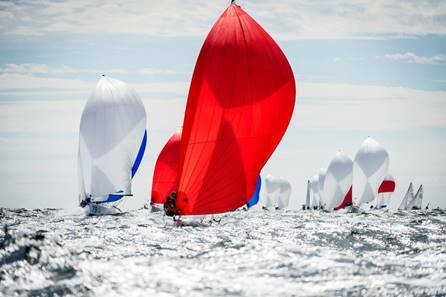 Ronning had led the standings for the first two days of the championship but came into the final day 14 points out of first place behind Jamestown’s Tim Healy and his crew on Helly Hansen. With Healy crossing the line in fourth, Ronning was able to chip away at the deficit and, in race two, the margin was further cut to seven points when Ronning finished fourth and Healy finished eighth. However, in the final race, won by Brian Keane of Weston, Mass., on Savasana, Healy crossed the line in second with Ronning back in fourth, earning Healy and the Helly Hansen team the championship title on 28 points to Ronning’s 39. Keane retained third overall with 61 points, while Florida’s Martin Kullman, on New Wave, and Boston’s Heather Gregg-Earl, on MUSE, were tied, respectively for fourth and fifth, on 83 points. Gregg-Earl and the crew on MUSE were also the Corinthian (non-professional) division winners. Except for one day, the conditions over the five days of racing had been strenuous and exhausting. “It was a fun week,” said Healy. “The nice part is there was wind the whole time; we enjoyed that, but because there’s wind you have to work hard and at this point everybody is tired but also excited at the same time.” This is Healy’s third world championship title as he adds the J/70 title to two he has won in the J/24 class (2013, 2010). The youngest competitor on the race course was 13-year old Julian Sudofsky of Marion, Mass., who missed a week of eighth grade at Old Rochester Regional to race with his father Mike Sudofsky on Carlos. The young sailor was not simply enjoying a week off from school; as a veteran in the J/70 class he has twice raced in Key West Race Week, along with events in Annapolis and Cedar Point. “Even though we didn’t do too well, we had so much fun because everyone was top competitors,” said Sudofsky who handles the bow on Carlos. “I just got to see Tim Healy, and Brian Keane is also my neighbor,” he added. Seeing 86 teams, representing 14 nations, on the starting line for any sailing event is significant. For those 86 teams to be contesting the first-ever world championship of the J/70 class is a testament to the popularity of this boat which was introduced just over two years ago, and even more notable was the mix of sailing royalty that was peppered throughout the fleet including: 2008 Finn Olympic Silver Medalist Zach Railey of Clearwater, Fla., 2004 Tornado Olympic Silver Medalist John Lovell of New Orleans, California’s 1996 Soling Olympic Bronze Medalist Jeff Madrigali, 2013 America’s Cup winning strategist and 2012 Laser Olympic Gold Medalist Tom Slingsby of Australia, 2011 Lightning Pan Am Games Silver Medalists Jody Lutz of Brick, N.J., and brother Jay Lutz of Houston, who is also a four-time world champion in the J/80 and Lightning classes, 1984 Windsurfing Olympic Silver Medalist Scott Steele of Annapolis, Olympian and two-time Star World Champion Phil Trinter of Richmond, Va., 2013 Star World Champion John MacCausland of Cherry Hill, N.J., 2001 Sonar World Champion Mark Ploch of The Bronx, N.Y., and 2007 Snipe World Champion Tomas Hornos of Boston. Kalle Coster and Annemieke Bes, both of whom represented The Netherlands three times at the Olympic Games were in the fleet, as was Vermont’s 2012 Olympian Trevor Moore, along with New York’s Cory Sertl and Jody Starck, both of whom have won the Rolex Yachtswoman of the Year Award multiple times. Top-ranked match racers Taylor Canfield and Stephanie Roble, 2005 J/24 World Champion Anthony Kotoun and Rolex Yachtsman of the Year Eric Doyle were all onboard as was 2006 Audi Etchells World Champion Jud Smith of Marblehead, 2013 J/22 World Champion Allan Terhune of Arnold, Md., and 2014 J/24 US National Champion Will Welles of Portsmouth, R.I. The silver fleet was won by Mark Ploch on Sugar Daddy after finishes of 3-1-3 allowed him to edge out Puerto Rico’s Marco Teixidor, on Cachondo, with 113 points versus 121. The September 8-13 competition was hosted by New York Yacht Club at Harbour Court, with regatta headquarters at Sail Newport, Rhode Island’s Public Sailing Center.